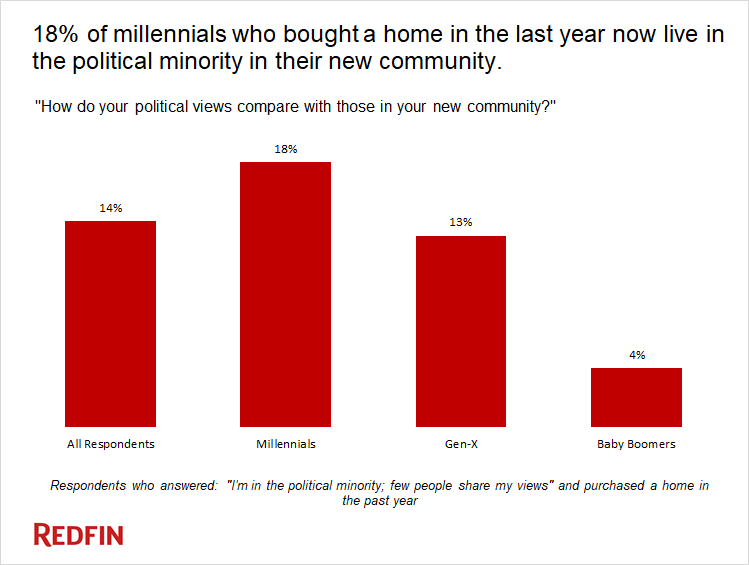 Redfin today released the first set of results from its 2017 housing market sentiment survey, a three-part report on how politics, society, the economy, affordable housing and technology have impacted the way people sell and buy homes. The first part of the report, which is based on the survey responses of 4,270 U.S. residents in 14 metropolitan areas, focuses on how immigration policies and proposals, political diversity and racial discrimination are impacting buyers‘ and sellers‘ decisions. 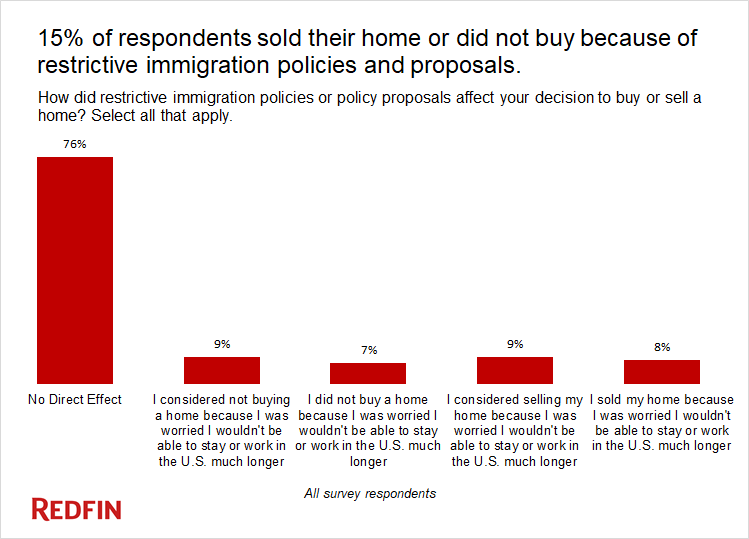 According to the results, 15 percent of respondents sold their home or did not buy a home because of restrictive immigration policies. Eight percent said they sold their home because they were worried they wouldn’t be able to work or stay in the U.S. much longer, and seven percent of would-be buyers said the same. Another 18 percent said they “considered” not buying or selling for the same reasons. Furthermore, Redfin says certain markets are more likely to be impacted by immigration policies and proposals. Buyers and sellers in Los Angeles (32.7 percent), Baltimore (18.5 percent) and San Francisco (16.8 percent) were most likely to say they sold or didn’t buy a home because of concerns that their time working or living in the country could be limited. When it comes to political diversity among communities, the survey revealed that millennials are more likely to live in diverse communities, which is due in part to this generation’s ability and willingness to move cross country for better weather (19 percent), more affordable housing (17.8 percent) and lower taxes (16.9 percent). Lastly, the report dove into how racial discrimination impacted respondents of color (African American, Arab American, East/South Asian American, Latino and Native American) during the homebuying and selling experience. Thirty-seven percent of these respondents who purchased a home said they felt “that sellers or their agents were less eager or may have been less eager to work with them because of their ethnicity or race” — a 6 percentage point decrease from the last housing market sentiment survey in May. Despite this decrease, Richardson still says it’s unacceptable that a little over a third of homebuyers and sellers of color still feel that they’re not being treated fairly. “The two data points we have about the perception of discrimination in housing reveal just a snapshot of what amounts to a short moment in our country’s long history of racial inequality in housing, and change in the actual incidence of such discrimination is likely to happen only slowly over many years,” said Richardson. “It’s more likely that that the trend we see in this snapshot reveals an aberration last year around the contentious presidential election, when racial tensions and anxiety about discrimination were heightened,” she added. Redfin contracted SurveyGizmo to field a study between November 1st and December 6th, 2017 of 4270 people from the general population who indicated they had bought or sold a home in the past year, tried to buy or sell a home in the past year or plan to do so this year. The survey targeted 14 major metro areas (Austin, Baltimore, Boston, Chicago, Dallas-Fort Worth, Denver, Los Angeles, Phoenix, Portland, Sacramento, San Diego, San Francisco, Seattle and Washington, D.C.